Directed by Lesli Linka Glatter and written by Harley Peyton and Robert Engels, the fourteenth episode of Twin Peaks entitled Demons revolves in the aftermath of Audrey Horne’s rescue Special Agent Cooper, Sheriff Truman, and Hawk where Cooper has a revelation about the rescue. Even as he informs Benjamin Horne that he’s rescued Audrey where there is some concern from Audrey about her father knowing about his involvement in One-Eyed Jack’s. It’s an episode where there’s some closure in some storylines but more intrigue emerges as a major break occurs as it relates to the mysterious character called BOB. The sense of drama and suspense that looms in the episode as well as the aftermath of Donna Hayward and Maddy Ferguson’s attempt to retrieve Laura Palmer’s secret diary from Harold Smith would also have some revelations for the young women as Maddy decides to return home. For Donna, the attempt would have her talk to Sheriff Truman about the attempt as she was saved by James Hurley who had no involvement though he is still under Truman’s watch. Arriving into Twin Peaks is Cooper’s superior Gordon Cole (David Lynch) who arrives with some news about Cooper’s former partner where Cole’s appearance as a man that is highly-deaf and wearing earphones with a machine attached to adds to many of the quirky elements of the episode. Especially as he talks very loudly with whoever he talks to as that person where it creates a few awkward moments but also some chilling moments. 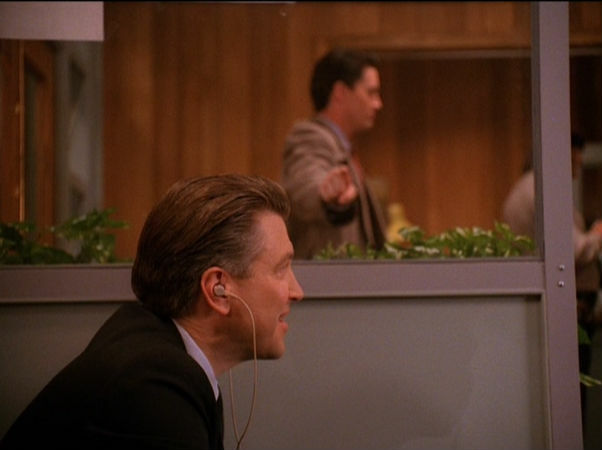 Most notably the ending where Hawk had finally captured the one-armed man Gerard who would convey a message from the spiritual world as revealed a lot about BOB as well as some key clues to who could be Laura Palmer’s killer. That sense of drama and suspense also plays into Josie Packard’s own storyline as she is leaving Twin Peaks to return to Hong Kong under the threat of Jonathan where she makes a deal with Benjamin Horne and says goodbye to Truman who professes his love for her. It adds to a lot of what is going on as Horne’s attempt to deal with Mr. Tojamura becomes difficult as Leland Palmer has returned to work full time where his eccentric behavior becomes a liability. It’s among these serious moments that occur in the episode which includes Leo Johnson return in his vegetative state where Shelly and Bobby learn about how much money they’re getting where the outcome is disappointing. It’s among the moments in the episode that are intense yet is balanced by its humor such as the Gordon Cole character and a small subplot where Ed Hurley copes with Nadine’s newfound super-strength. Demons is a superb episode of Twin Peaks from Lesli Linka Glatter as it’s an episode that not only maintains its offbeat tone but also adds a lot of stakes into what is happening as it relates to Laura Palmer’s death. Even as some big things are emerging while those in the small town of Twin Peaks are either benefiting or suffering from the outcome of her death. In the end, Demons is an excellent episode of Twin Peaks from Lesli Linka Glatter. This was a great episode and your review brought back fond and creepy memories. Episode 14 was one of the most recent great episodes of the show, given that it never was quite as good once we discovered Laura's killer. Can't wait for the reboot. Yeah, I've got about almost half the series to cover and then re-watch the film. It's been fun so far. How was the movie anyway? I've never seen it. @Matt-It's been a long time since I've seen it as I'm going to re-watch it hopefully next month.